If you asked around the traps, and wanted to know what is the latest Buzzzzz! in fishing circles, it would have to be the phenomenal growth in the sport known as Fly-Fishing and in particular Salt Water Fly-Fishing! Fly fishing is one of the oldest known methods of angling. It is steeped in history and has its own rules, traditions, techniques and skills, all of which have been developed from the fine art of deceiving fresh water fish into taking the delicately placed offering. 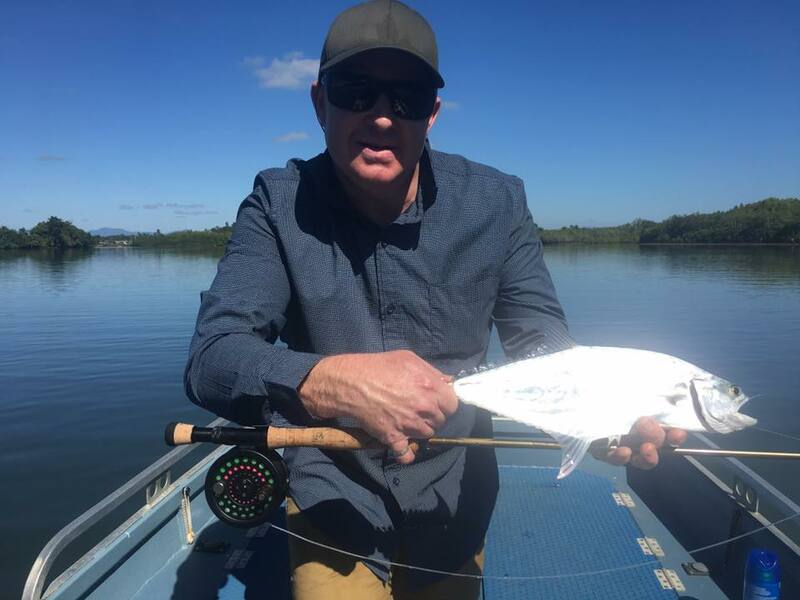 Salt-water fly-fishing however is re-writing the rulebook and here in Tropical North Queensland we have an abundance of piscatorial targets well suited to this magnificent sport. Our fish don’t usually feed on insects, jungle stream species excepted, but rather small fishes, (large baitfish if talking blue water targets) shrimp, prawns and crabs are their prime tucker and obviously your offering must imitate their foods. We tropical anglers therefore use quite large flies by comparison to our southern, fresh water trout stream cousins. Whether your bag is wading along a secluded white sandy beach, sight casting to schools of golden trevally; to deftly placing the “pink thing” on the nose of a prime silver salt water barramundi hiding amongst the mangrove roots, to the ultimate thrill of landing a billfish on fly, our region can deliver all of the above and lots, lots more. 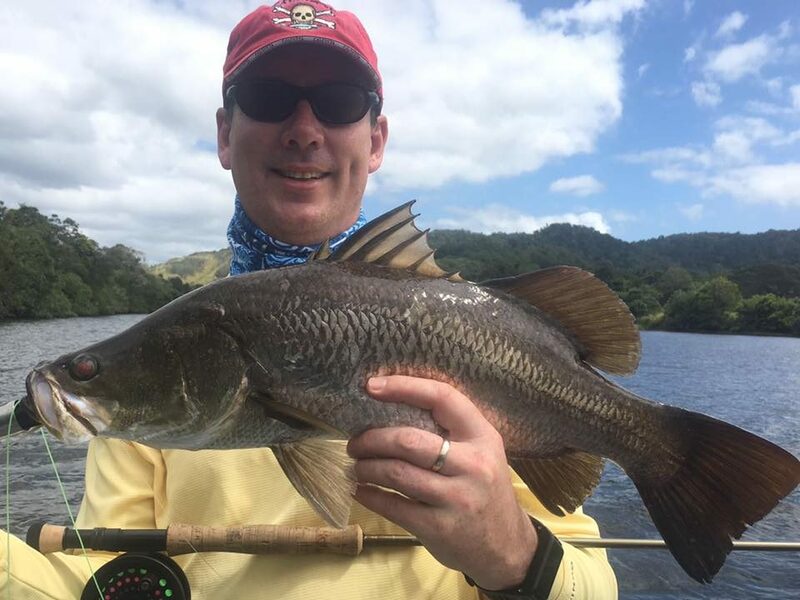 Within easy striking distance of this modern tropical city of Cairns lie many fine fly-fishing opportunities. Many articles have been penned about the preferred tackle for this species and that, the best lure, the most productive fly. A lot however depends on the angler’s confidence and skill level. Confidence in the quality tackle at hand to do the job, confidence in the chosen fly to imitate the food source and the skill required to work the retrieve in a way irresistible to the predatory fish. On some occasions a hungry, excited fish will have a go at almost anything. On most occasions it will take a little bit of patience, skillful presentation and repetitive casts to entice the right response. 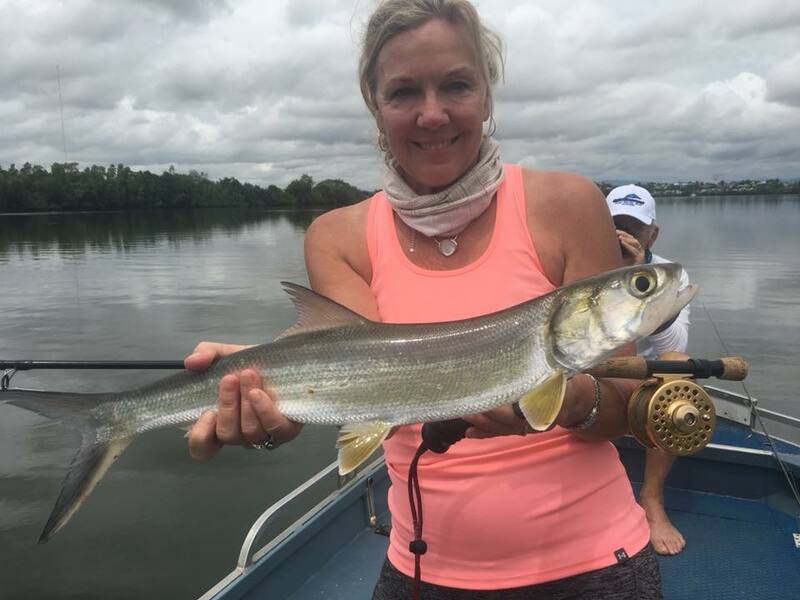 Once the art of fly-fishing is mastered though, most proponents enjoy a level of satisfaction rarely found in any other form of angling or sporting pursuit, for that matter. It’s a real deception, a real challenge, to present that offering in the fish’s vicinity, to twitch the fly so enticingly and retrieve it so subtlety as to have your quarry engulf the fly with deadly intent. Fly-fishing is very visual, this adds another dimension to the art. Being physically connected as well as visually connected to your quarry enhances the senses, pure adrenaline. Note: our tropical fish are usually very aggressive, they will hit with gusto and offer a good turn of speed when hooked. Deft rod work and plenty of backing is the norm. This is no place for dinky trout reels (no offence intended). Our fish are not primarily insect feeders and matching their food source is obviously a major consideration. In fresh water streams Sooty’s will even eat berries falling into the water. Species like Permit can be singularly focussed on small crabs while Barra will do the same on jelly prawns or shrimp amongst the weeds. Milkfish are regularly caught on “bread” patterns! We commonly use quite large streamer flies in various patterns and colors with the following proving reliable fish takers in our waters.. Obviously the thrill of tying your own fly and having it succeed in capturing a new species is a very rewarding exercise, if you think it might work, give it a go! 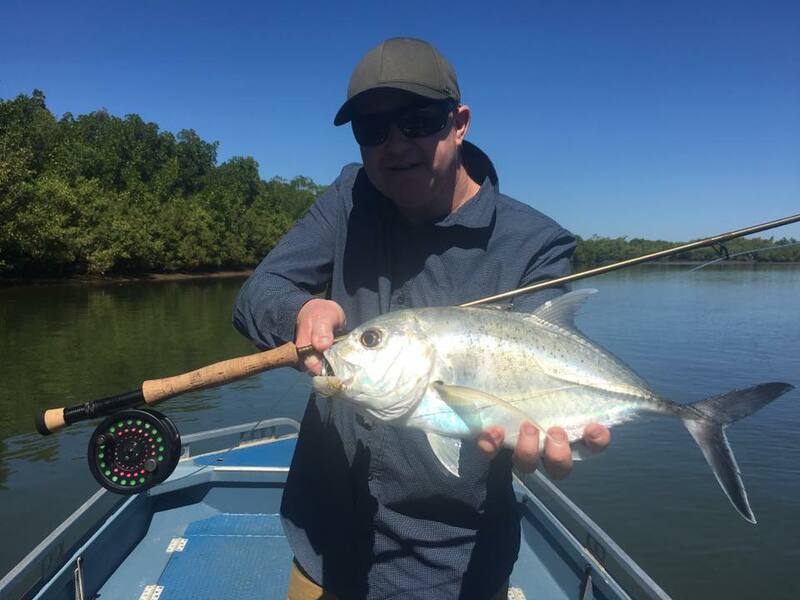 Lure and fly fishing in the Tropical North is a real buzz, so please visit our Rigs And Bait section for some more tried and proven tips and tactics for our local conditions. 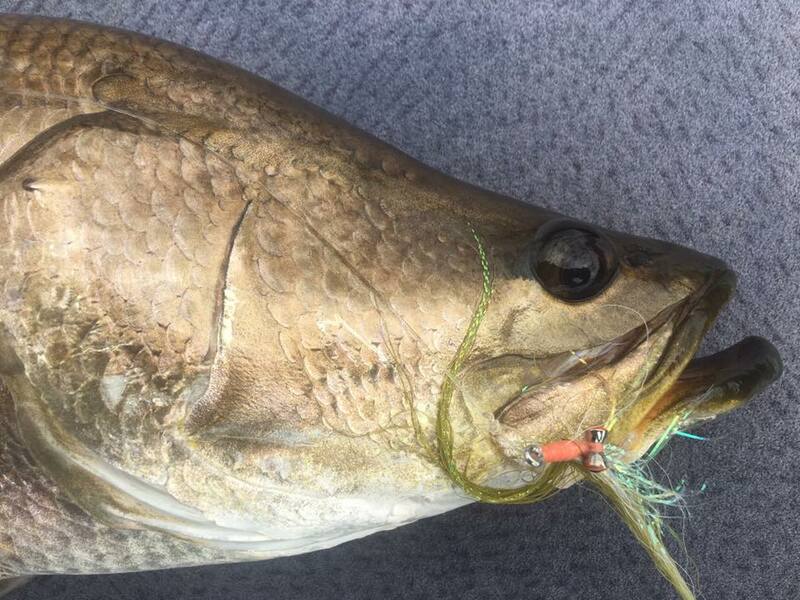 Any fish that will take a lure can be successfully targeted using fly fishing techniques. 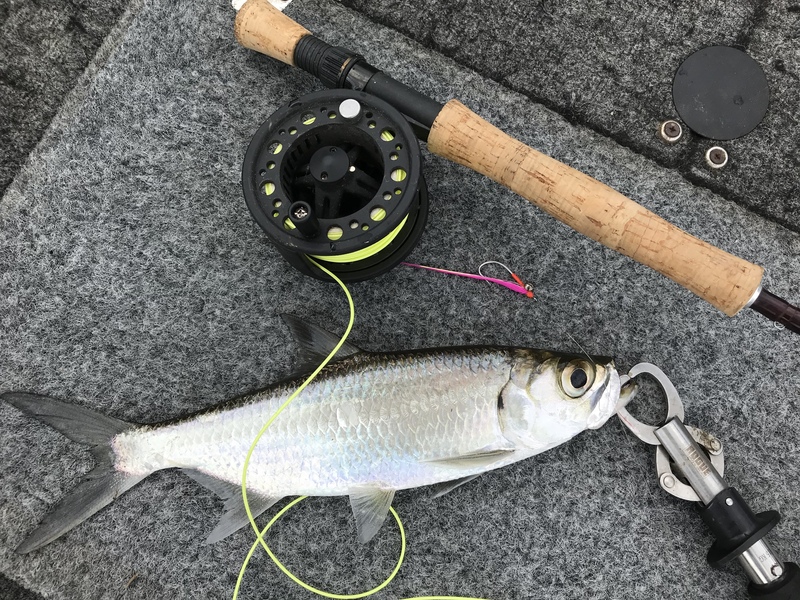 Although I don’t intend to list them all here (refer to Target Species) we have reproduced an excellent article penned by Steve Starling from Modern Fishing magazine listing his prime salt water fly “flats” fishing targets.